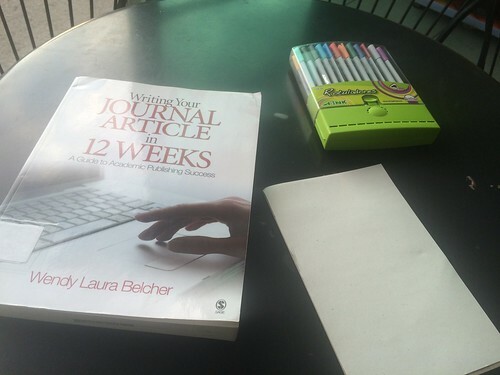 Despite the fact that I have interacted with Dr. Wendy Laura Belcher quite a lot, we discuss academic writing almost every day, I had never written my reading notes of her book (Writing Your Journal Article in 12 Weeks – A Guide to Academic Success, published by SAGE). Mind you, I’ve used her book on a regular basis (she calls it a workbook and I think it’s a blended mix of book that must be read and workbook that can be used to solve exercises). Anyways, I have decided to post my reading notes of her workbook. I must indicate from the start what I noted on Twitter: I don’t own a copy, because SAGE put its price tag really high ($94 USD plus shipping and handling). It’s a ridiculous price given that it is targeted to students and early career scholars, groups that actually don’t have that much money. Dr. Belcher and I have discussed how absurd this price is, at length. I read, and I regularly use my own institution’s copy. But I haven’t acquired one because it’s really expensive. Nevertheless, as I’ve noted on Twitter, it’s a really, really good investment. Dr. Lisa Munro has blogged about her experience writing an article using the workbook, her first post can be found here. There are plenty of testimonials on Twitter from people who have used Dr. Belcher’s book, so I don’t think she needs any more endorsement. Nevertheless, I wanted to note what I learned from her book here. As I have noted, one can work out of a library copy and use the free workbook forms that Dr. Belcher offers. Below, you’ll find my tweets about the book, transformed into reading notes. Dr. @WendyLBelcher offers on her website a treasure trove of information, articles and the workbook forms https://t.co/RYgtgkwsf6 FREELY. As I noted, this workbook is designed to help the reader revise a draft journal article for final submission to a journal, and therefore, one could use other approaches (like the one used by the author of How to Write A Lot, Paul Silvia – I call this approach “word vomit”). The Belcher approach works for me because I am very regimented, disciplined and systematic. he The workbook is VERY structured, and it demands from the reader very specific tasks. It also forces the reader and workbook user to self-reflect on a daily basis, something the fast-paced academic environment often doesn’t allow you to do. I get lots of papers for peer review where author has ran out of gas. This happens to me. What Belcher suggests is to strengthen BOTH. Week 11 on wrapping up and Week 12 on sending your article may also be conflated in 1-2 days (so it’d be 9 weeks to a journal article). Why do I like the Belcher book? Because I find the 12 weeks approach (similar to a quarter system when I teach) manageable and doable. If I were to teach academic writing Belcher’s #12WeeksJournalArticle I probably would teach it as a 9 week model for my colleagues. Or a 12 week model for my students. The workbook can even be used just for fun reading to diagnose your own writing. Overall, as I said, like the workbook and not the price. It is what it is, the author has no say. If you were to read the Spanish translation, FLACSO sells it for MUCH CHEAPER than the English one.